These fab breakfast soda breads from Dan Lepard’s Short and Sweet were the only things I baked this weekend. I had thoughts and plans to make at least an ice cream or a frozen yoghurt but thought better of it and concentrated, instead on the long assignment due in a couple of weeks. This work and school-on-the-side is seriously exhausting at the moment, have spent the whole weekend getting on with it and a headache but it’ll be over soon thankfully. Anyway, the soda breads are highly recommended, very quick to make, very easy and very good. We had them warm with leftover pork belly and scrambled eggs. 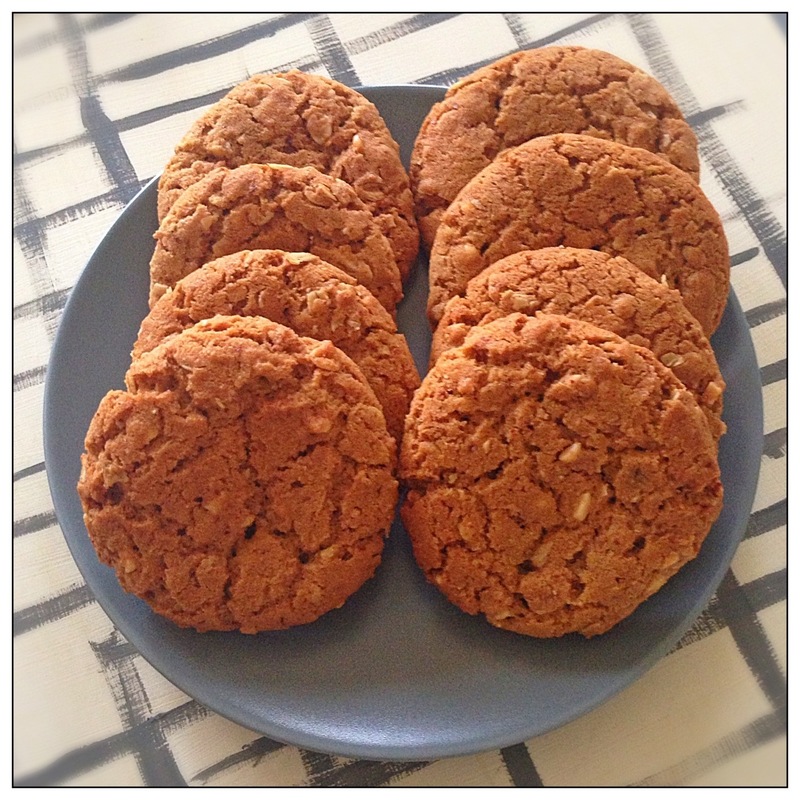 I’ve wanted to make these Peanut butter cookies from Dan Lepard’s Short and Sweet for a while and as am enjoying a fairly lazy Sunday I thought they wouldn’t take too long + they are reasonably healthy. 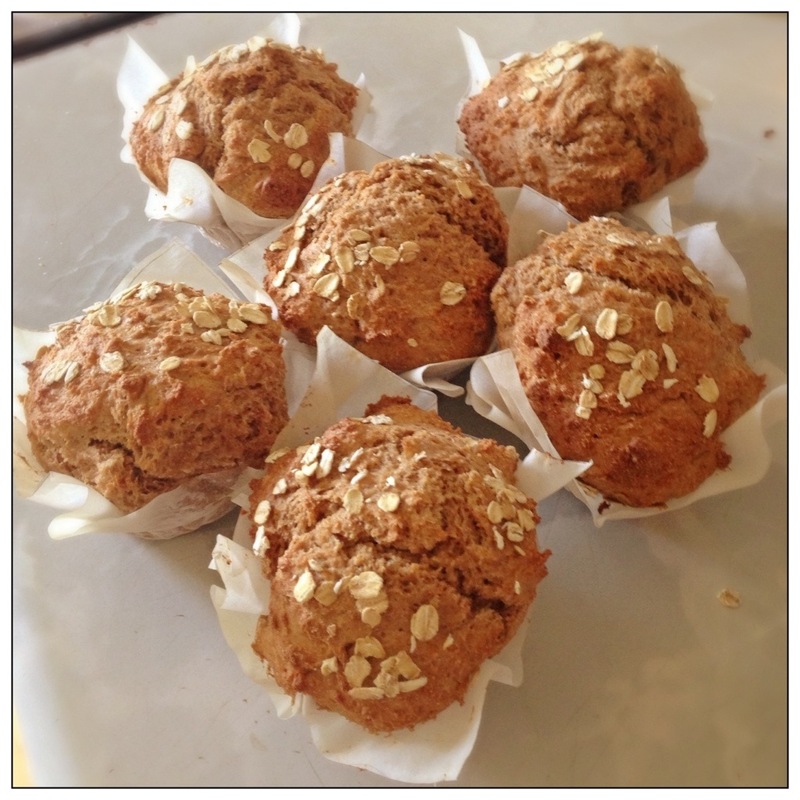 Rolled oats, wholemeal flour (or spelt, I used wholemeal as it’s nearing expiry date) crunchy peanut butter and a whole load of sugars – I used caster and both light and dark soft brown. I also reduced the sugar quantity a little. They are seriously delicious and worth making, I’ve ended up with just under 30 rather large ones. Crunchy, nutty and very moreish! It took some maneuvering to get the ice cream maker bowl to fit into the freezer (small and recently loaded up with ‘stuff’) but fit it in I did because I really fancied some home made ice cream this weekend. I don’t think I froze the bowl for long enough beforehand though because it was taking ages yesterday afternoon, the ice cream was not really chilling and, as we were watching The Master at the same time I was getting pretty frustrated that nothing was happening. Nothing in the kitchen and nothing on the screen. I gave up on the machine and just froze the ice cream hoping for the best and soon after I gave up on the film too and nodded off. When I woke up the film was still on and Beloved informed me that I’d missed very little. What a pointless waste of time (Joaquin Phoenix very good though). The ice cream, though was well worth the effort, with a very intense and mildly bitter coffee flavour enhanced by good dark chocolate. This is a real treat for lovers of good coffee. Recipe came from Nigel Slater’s Kitchen Diaries II although I reduced the amount of sugar by a third – think Nigel has a very sweet tooth although Beloved did say he would have liked a bit more sugar. For me, this was perfect but I would consider perhaps using a mix of dark and white or milk chocolate in future. Or perhaps not, it really is very good just as it is. Like a chocolatey affogato. Very good aftertaste too. I do love a good fluffy bun and these Marmalade Chelsea buns are rather wonderful and very fluffy. Pretty light too, have had two for breakfast and am now perfectly content with all around me. The recipe came from Dan Lepard’s column in The Guardian. Dan suggests using half a Vitamin C tablet for lightness and that’s clearly worked as the buns have quite a high strong white bread flour content. Not a long list of ingredients (flour, little bit of butter, milk, egg, marmalade, currants, yeast and salt – I omitted the sugar and they are fine) and very simple to make. Would definitely recommend. Pure satisfying comfort on a cold and miserable day like today. I’ve been making quite a few marmalade treats recently because I had quite a bit of it before I decided to make more. There was the marmalade and dark chocolate ice cream which is fabulous and a stunning steamed marmalade sponge pudding, also a Dan Lepard recipe. I’d still like to do Delia’s classic marmalade bread and butter pudding and that’ll be it. Must leave at least some to have on toast! In New Forest, walking about for a few days. Earlier today on the train, Beloved kept pointing out particularly flooded and boggy paths, I just shrugged. Booked this weekend away ages ago, hoping for some nice weather, forecast says rain today and rain for the rest of the time we are here. Yay. Well, actually, it turned out to be pretty sunny today and mainly dry. We did a fantastically invigorating 9 mile walk from Brockenhurst, where we’re staying to Lymington – the distance between the two is not actually 9 miles but we didn’t do a direct route. And we had all sorts of scenery from a lovely little woodland and old school pubs to flooded riverbeds and salt marshes. First, Roydon Wood and sunny weather, so refreshing and such a marvellous contrast to grey and wet London we left this morning. A little while later and down some country lanes, we stopped for lunch and a pint at The Red Lion in Boldre which we both rather liked. After that, we were to follow Lymington River down to Lymington. Crossing the bridge at Boldre, you could tell we were going to be in for flooded paths shortly. And yes, the path was terrible but also great fun. Sank into the mud a few times, scratched hands and legs on brambles, got mud on trousers despite wearing gaiters and rather enjoyed ourselves. This is what it looked like close up. It got better after a while as we entered Lymington Reedbeads although the weather was getting worse. It started raining pretty soon but we were on a road by that point and it didn’t take long to get into Lymington. We stopped for a coffee and a break before heading out to the Saltmarshes. The rain stopped again and we even got some blue late afternoon sky. Caught two ferries (to Isle of Wight) passing each other. And the other side was a nature reserve, a bit flooded but great to look at nevertheless. It was very windy around here and while we spotted lots of birds, some had to work hard to stay up in the air. The Saltmarshes continue to Keyhaven but it was already late afternoon so we had to head back. It’s worth coming back here just to do this walk. We saw a couple of dog walkers around here but hardly a soul elsewhere. Guess we are here out of season. Weather forecast for tomorrow basically says everything from dry to snow and lots of rain. Hoping for dry but we shall see.